Hello to all our friends of Really Reasonable Ribbon. It's Karen Letchworth sharing today, and we're SO glad that you've stopped by today to get some inspiration using more of Really Reasonable Ribbon's AMAZING products. Today I'm focusing on all the GORGEOUS varieties of Baker's Twine carried at Really Reasonable Ribbon. Like many of you, I've always loved baker's twine. But did you know that Really Reasonable Ribbon carries 40 different varieties of Baker's Twine including 11 colors of Solid Baker's Twine? Well, it's true and they're all beautiful. 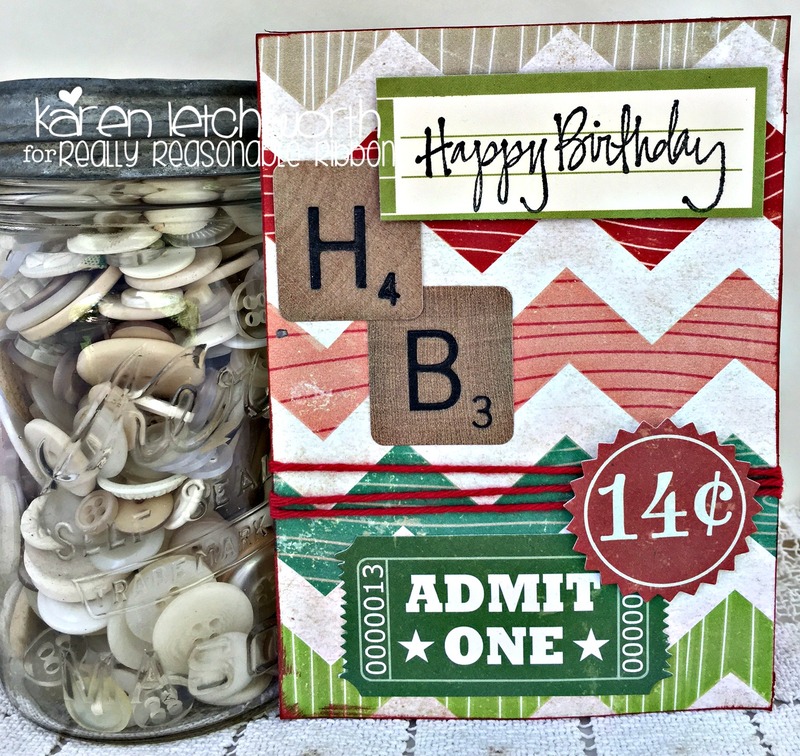 All three of my cards were created using Crate Paper's Party Day line. 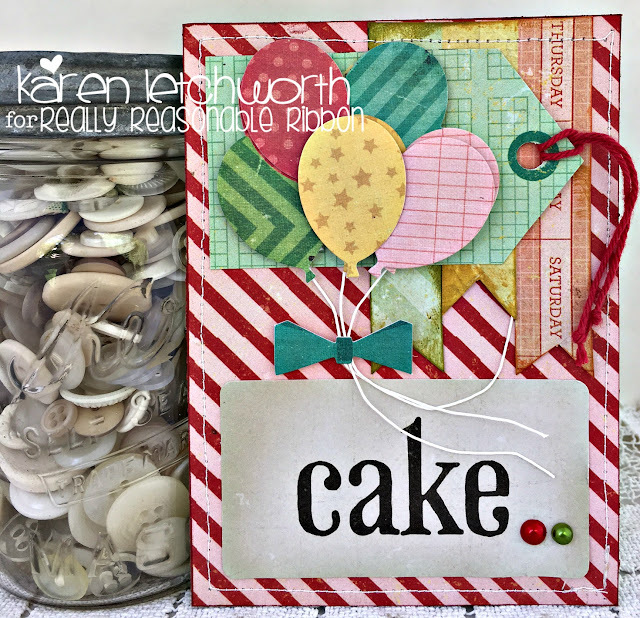 For my first card, I used the Solid Red Baker's Twine to add some streaming color to the green tag at the top of the page. Baker's Twine can easily be used on tags, for making bows, decoratively threading buttons, or even for tying up party favors. It's such a super versatile product. The second card again wraps a nice long length of the Solid Red Baker's Twine around the card. Wrapping baker's twine around a card is a great way to fill in empty space where you know you need a little "somethin' somethin' " but you don't know just quite how to fill in that space. I recommend having baker's twine in every color so that you will always be able to match it to any project. And at just $0.10 per yard, Really Reasonable Ribbon is a great place to stock up on all your favorite colors and styles. My third card has a long length of the sweet Solid Yellow (Lemonwood) Baker's Twine wrapped around its bottom, and I also tied a sweet bow with it. Like I said, there are so many great colors of Baker's Twine available at Really Reasonable Ribbon, and you're sure to find just what you need for your next project. I encourage you to stop by and check out ALL 40 VARIETIES of Baker's Twine at Really Reasonable Ribbon. 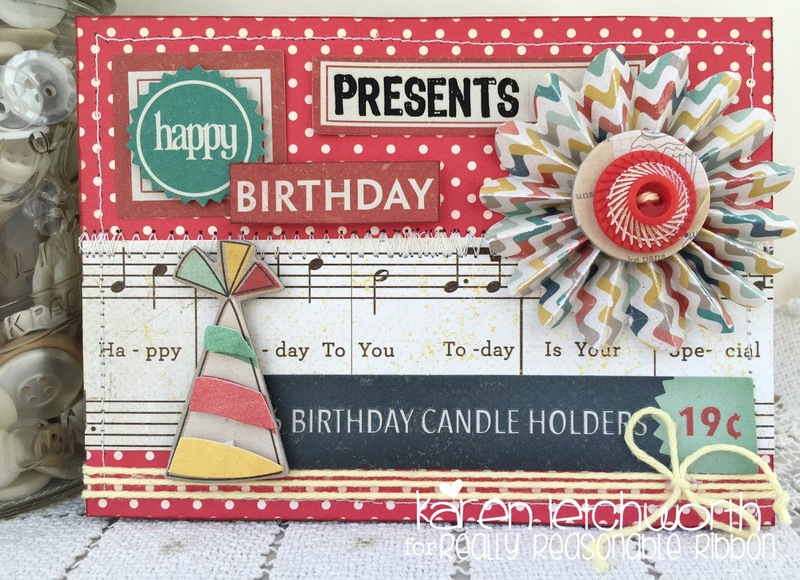 And don't forget about the FUN CHALLENGE taking place now on the Really Reasonable Ribbon Blog. We always LOVE having you play along with us. We're also hoping that these simple little birthday cards will make you want to pick up some new Baker's Twine. It's always the perfect touch! Just Beautiful as always Karen. I too love my bakers twine and flowers too. I love RRR products, they are all beautiful! I have never been disappointed any thing I have bought from them. Very cute cares with the baker twine and flowers.